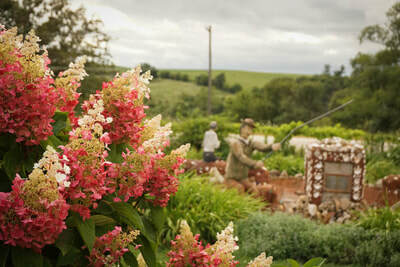 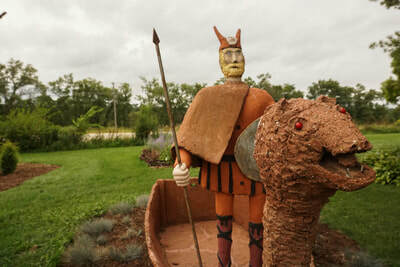 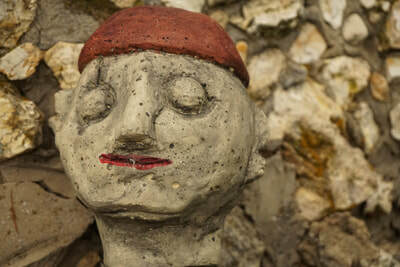 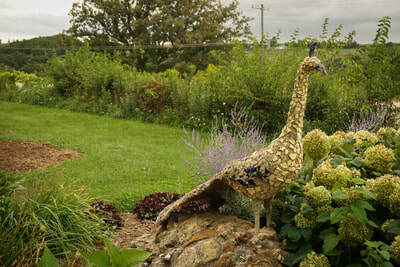 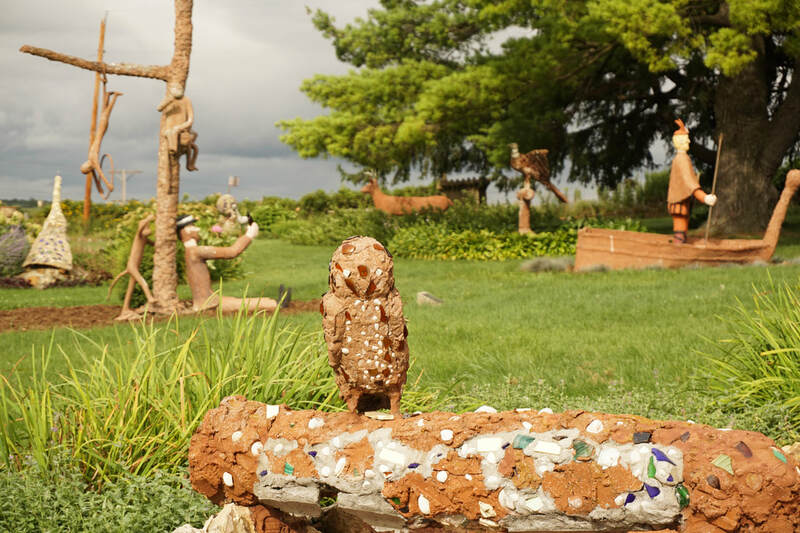 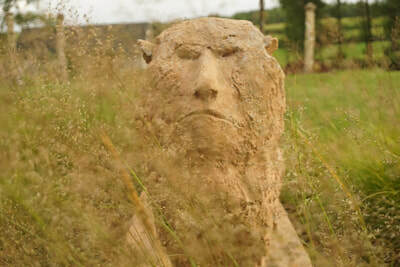 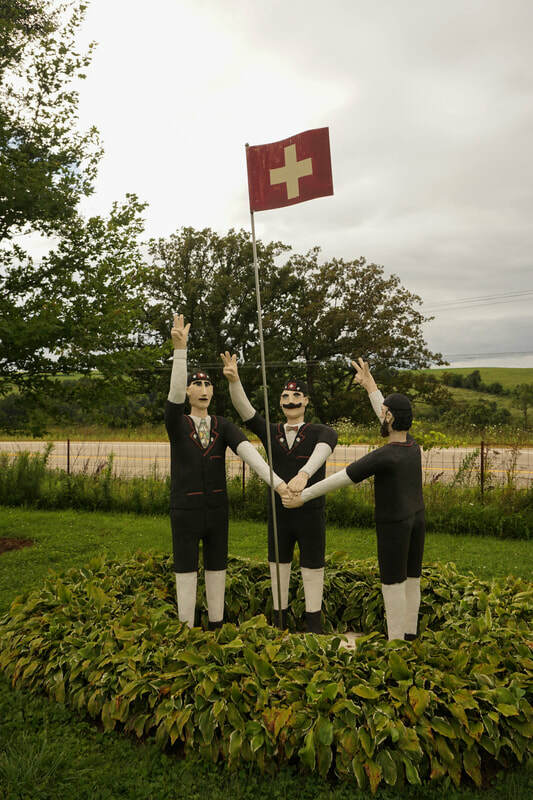 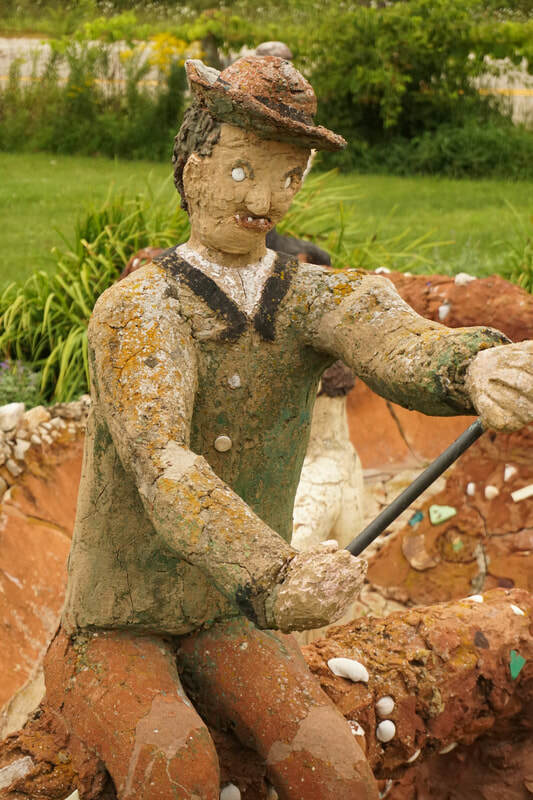 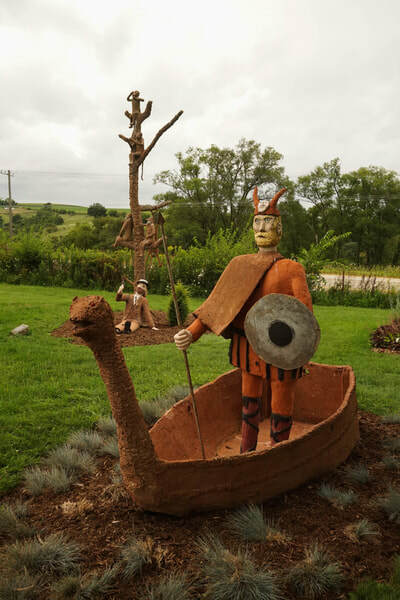 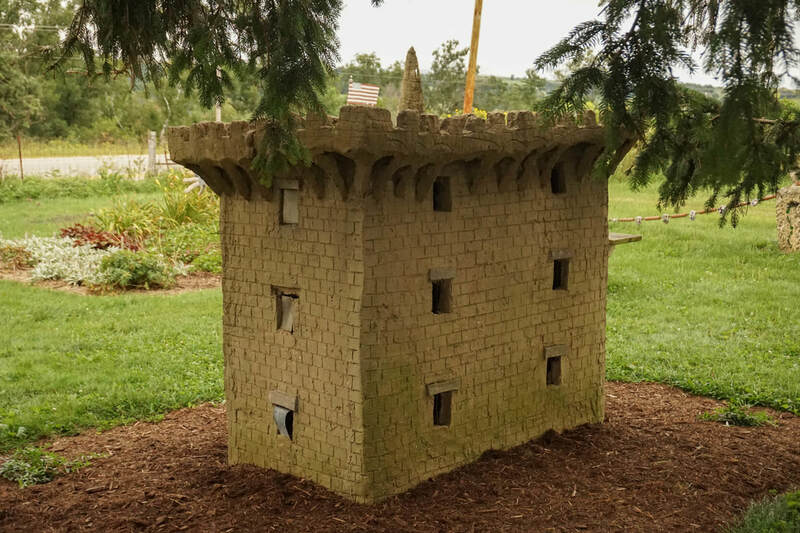 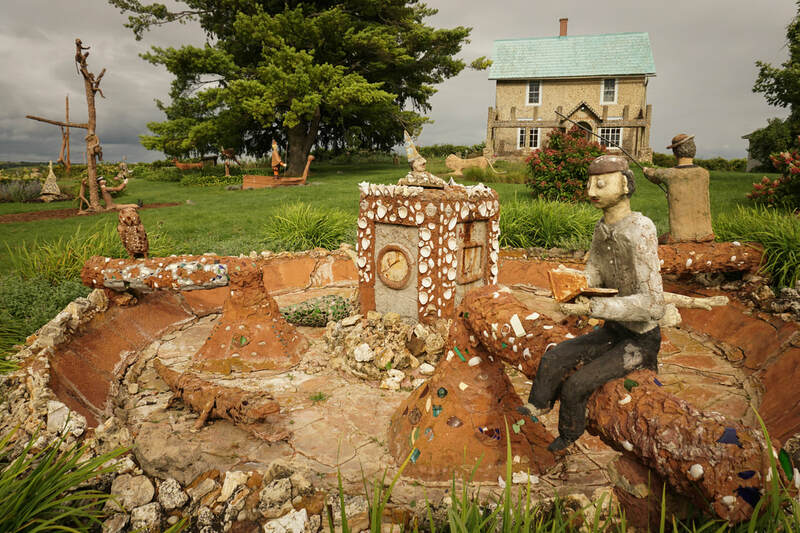 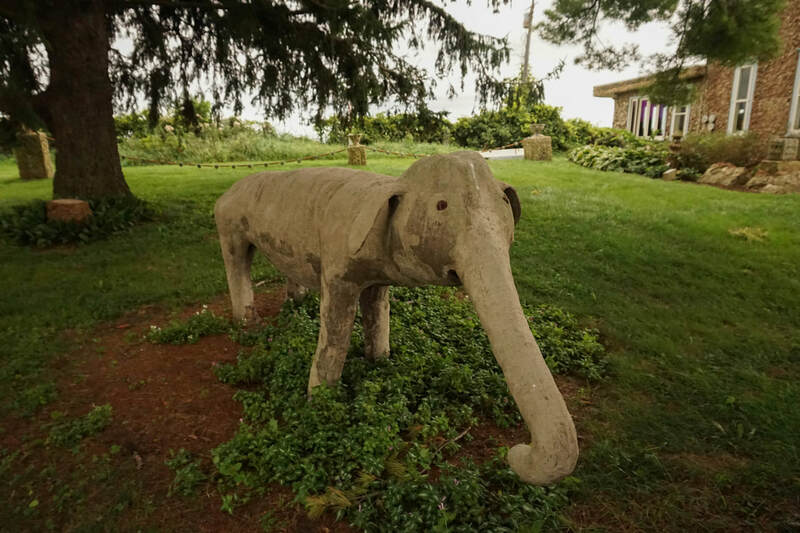 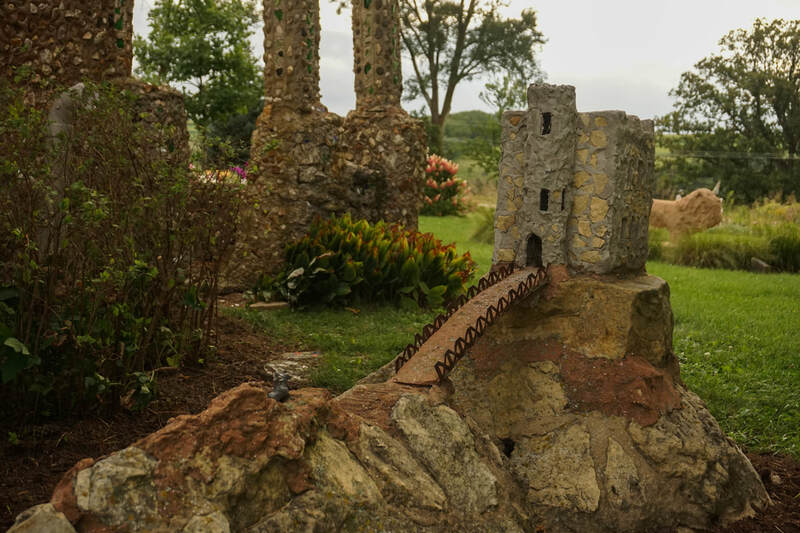 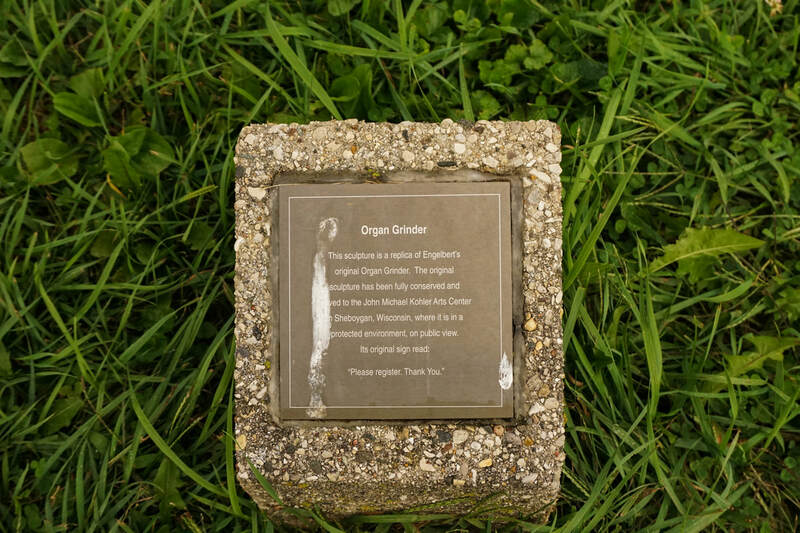 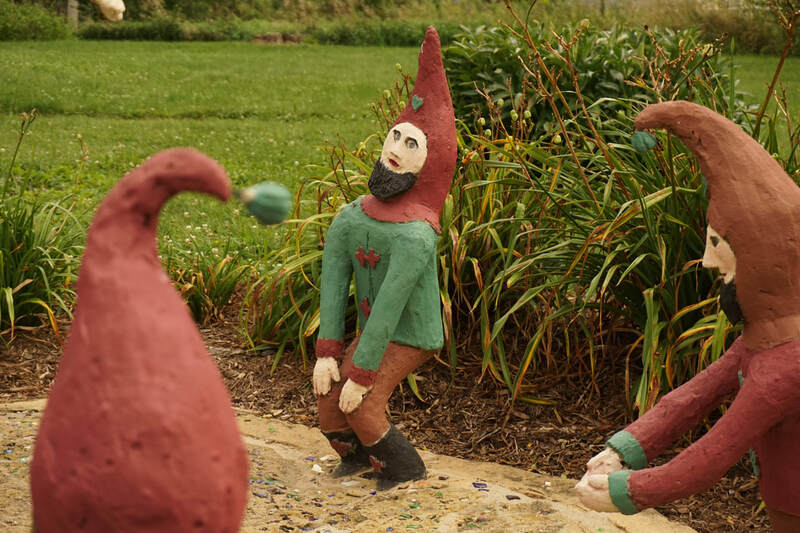 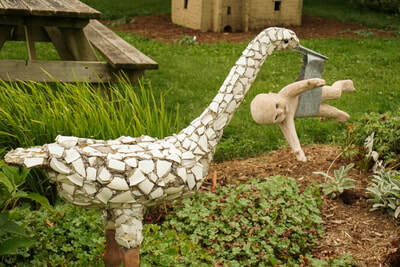 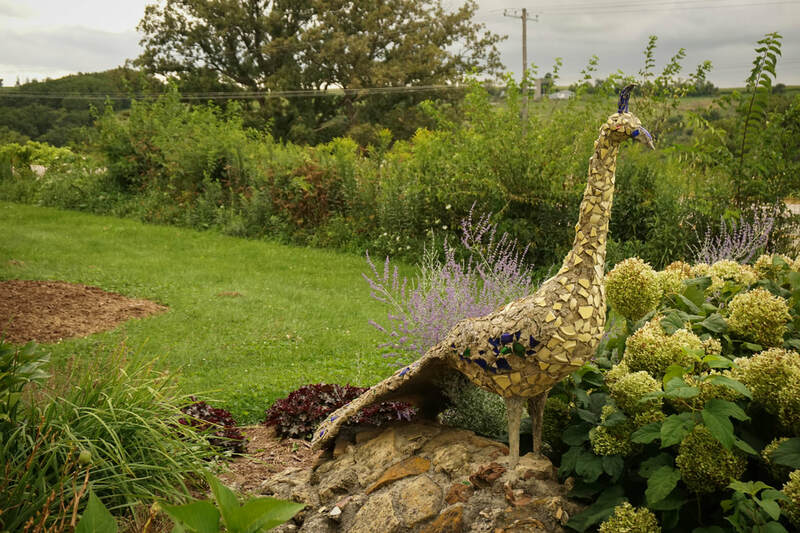 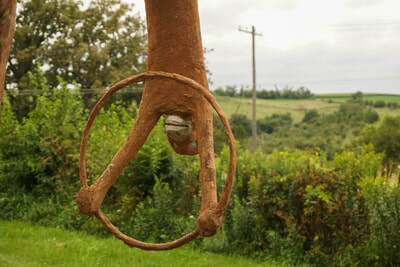 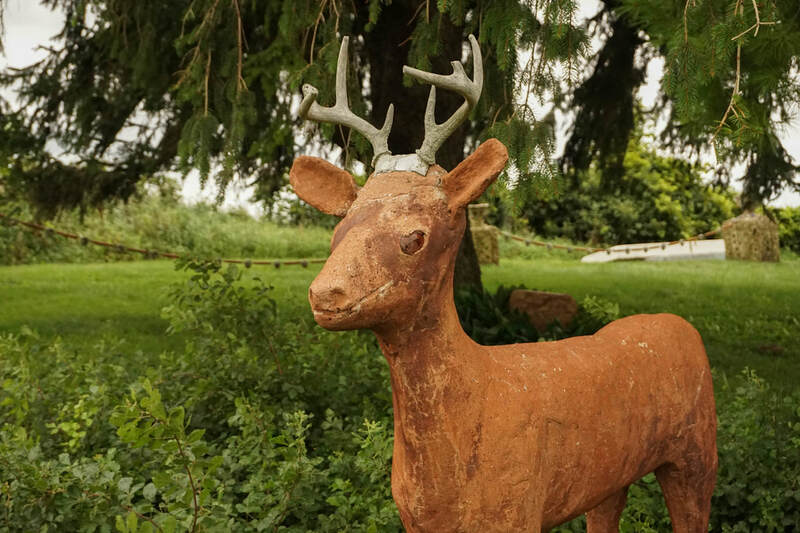 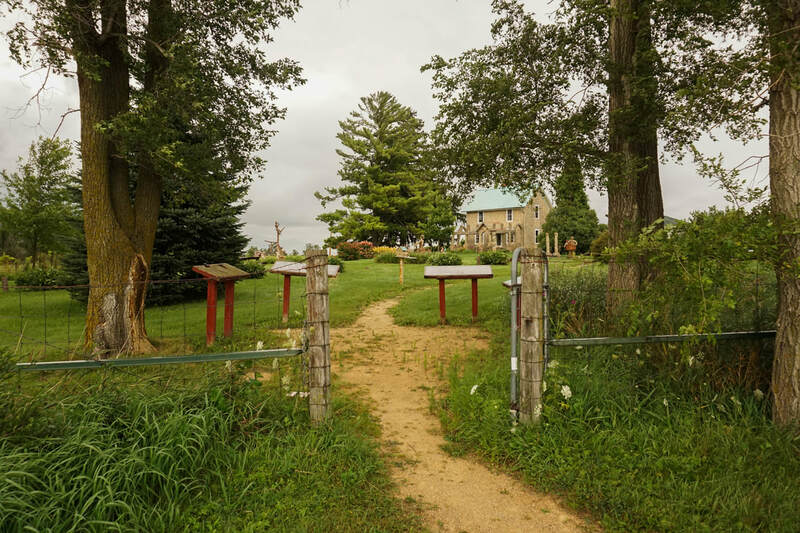 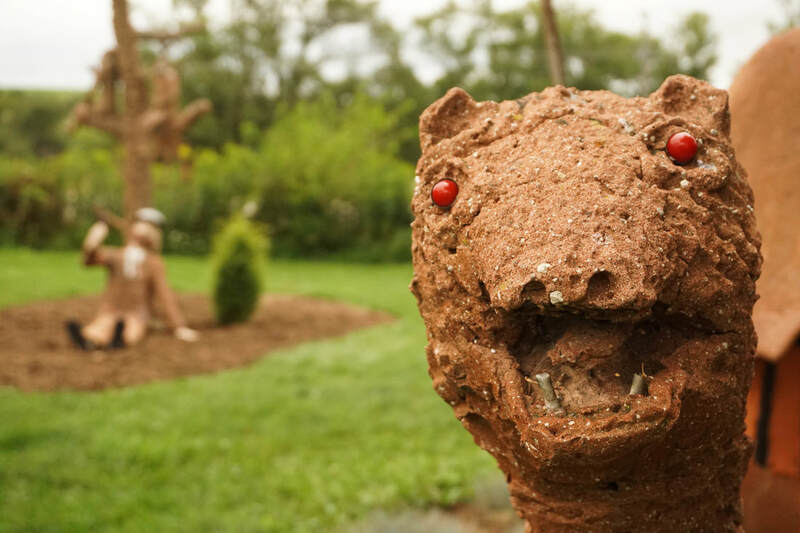 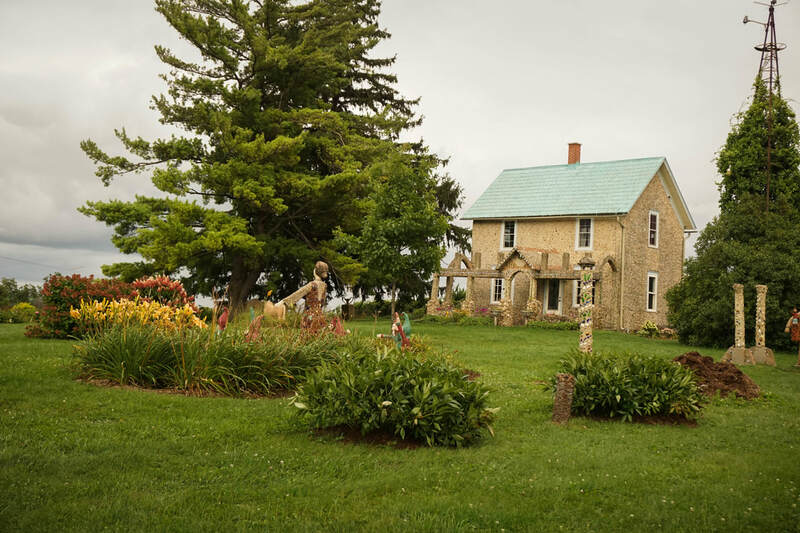 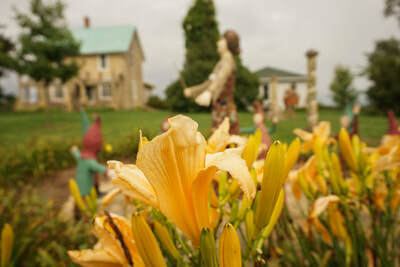 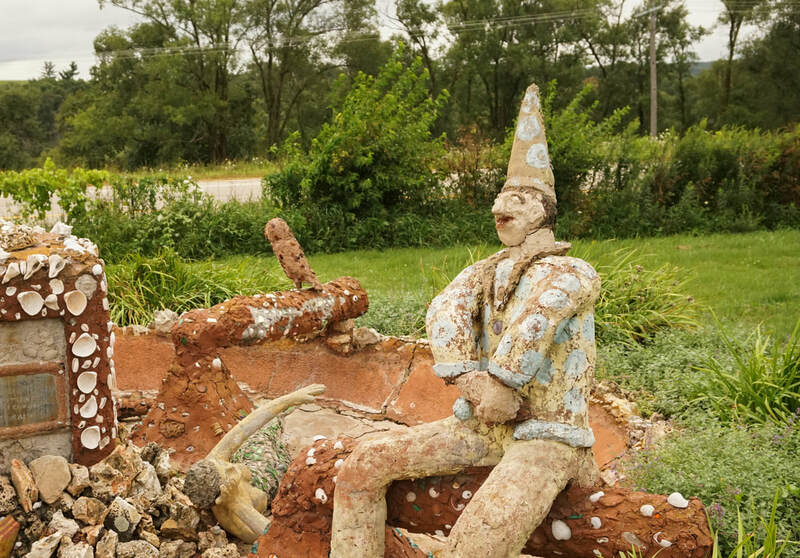 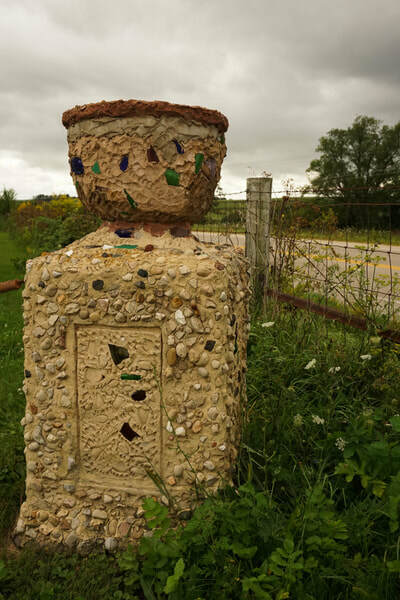 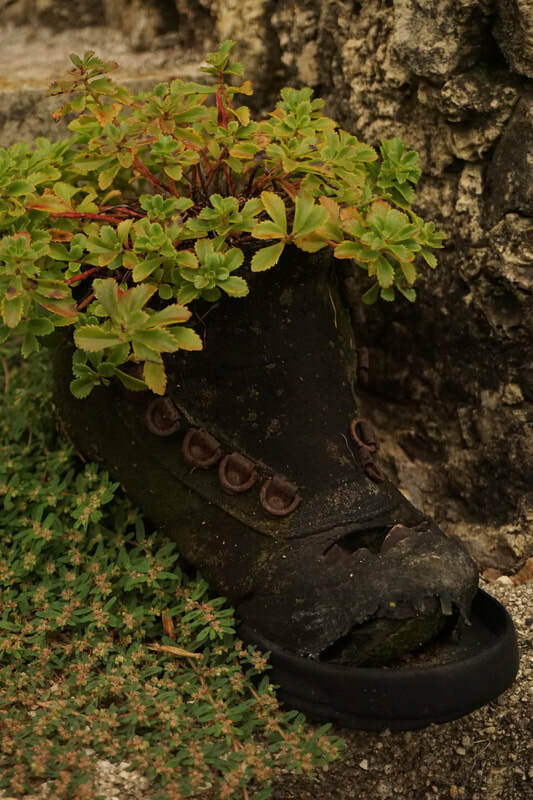 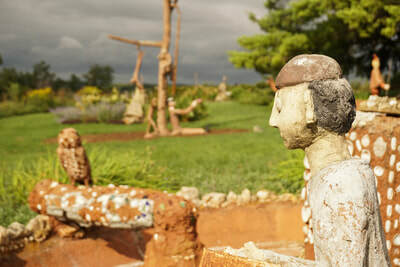 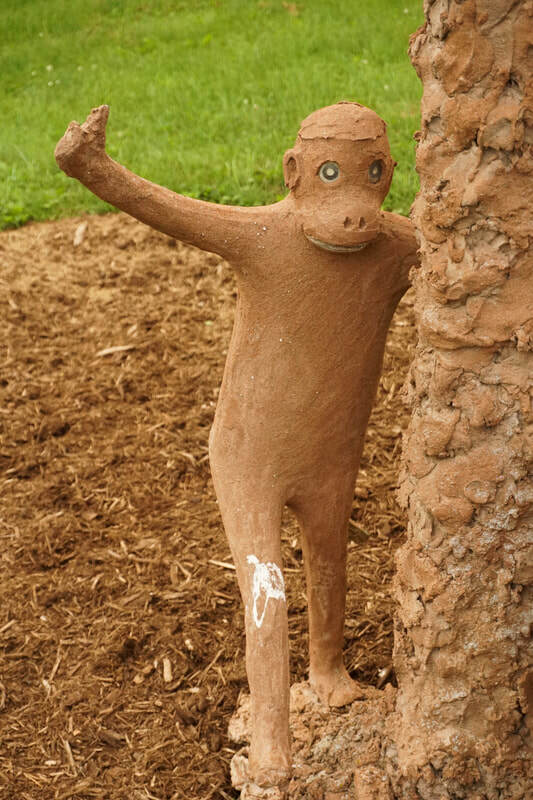 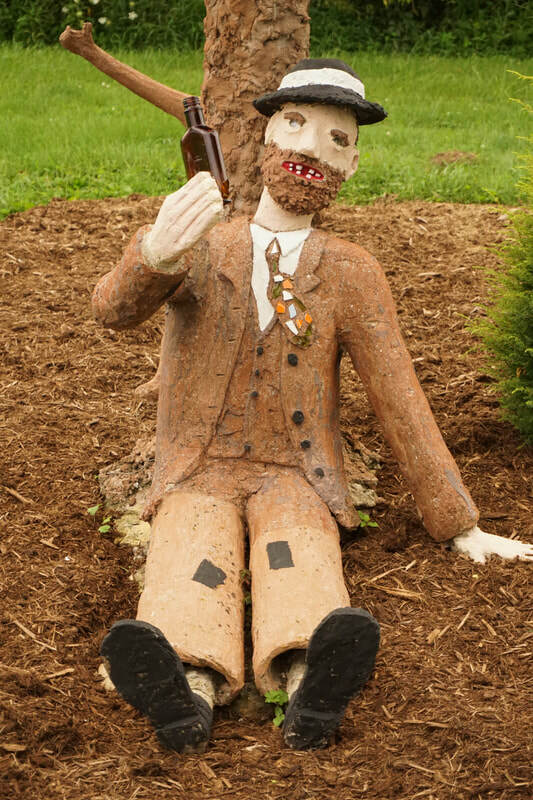 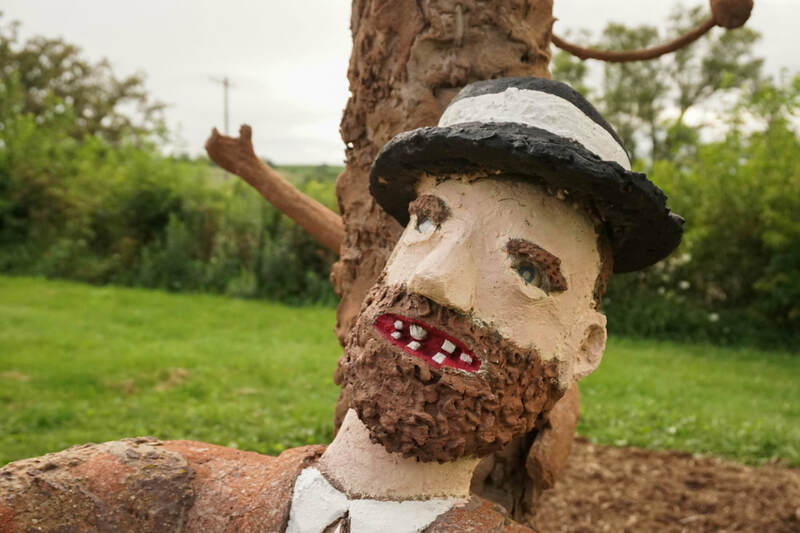 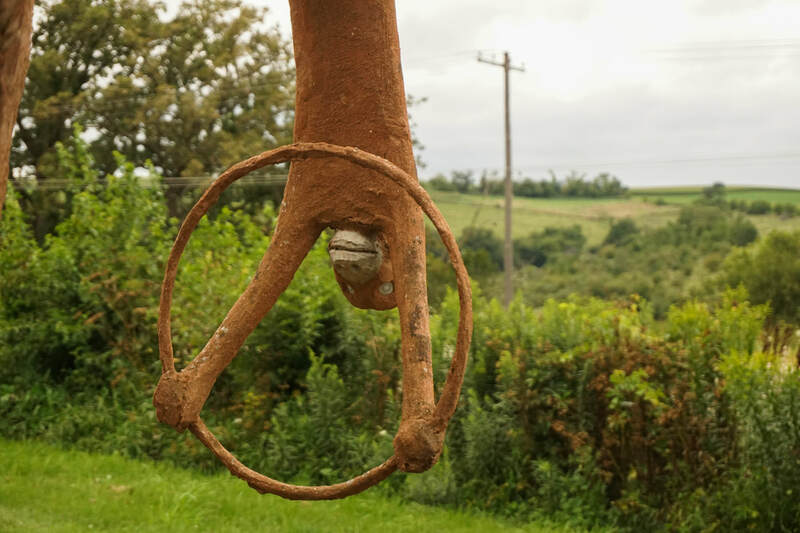 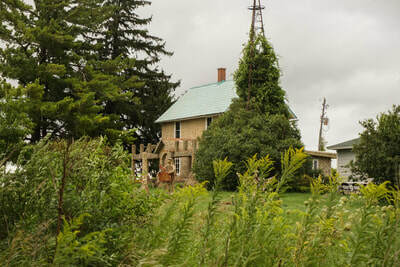 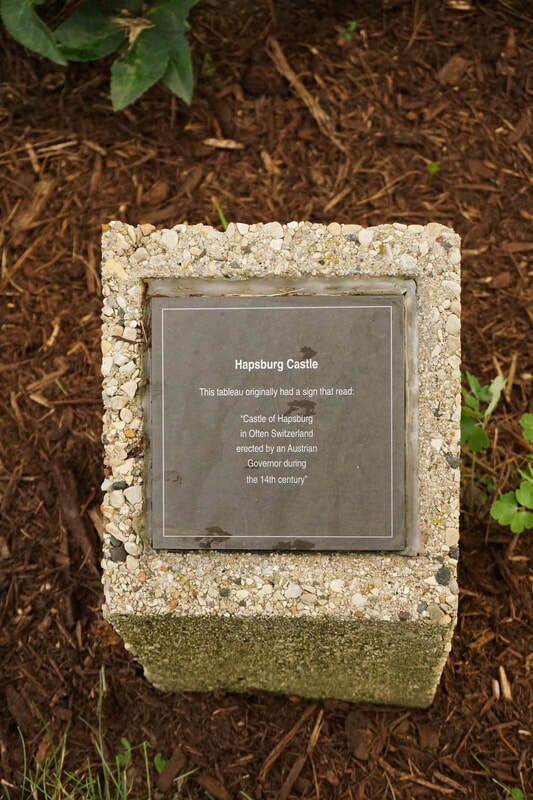 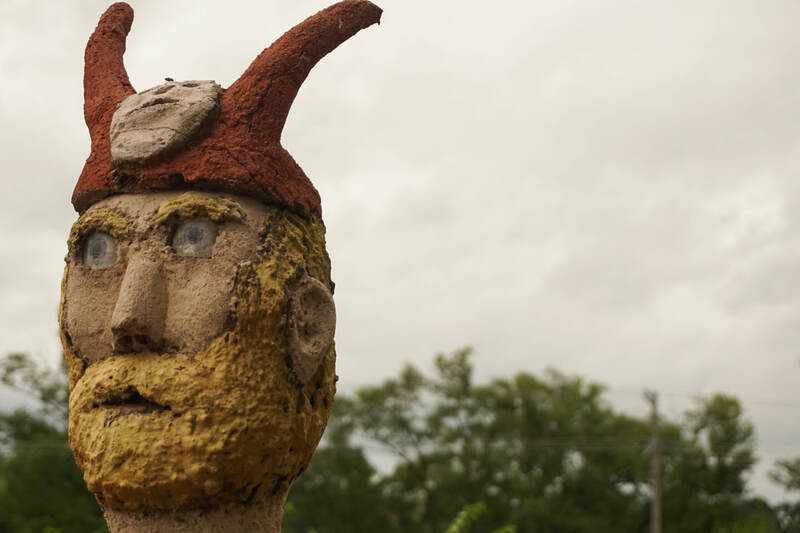 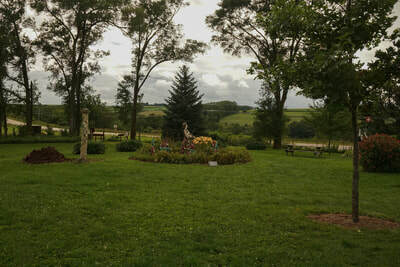 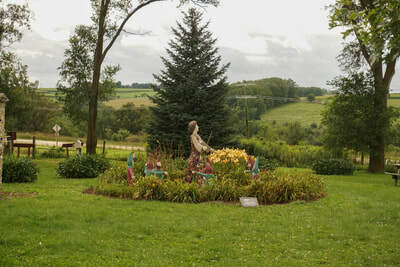 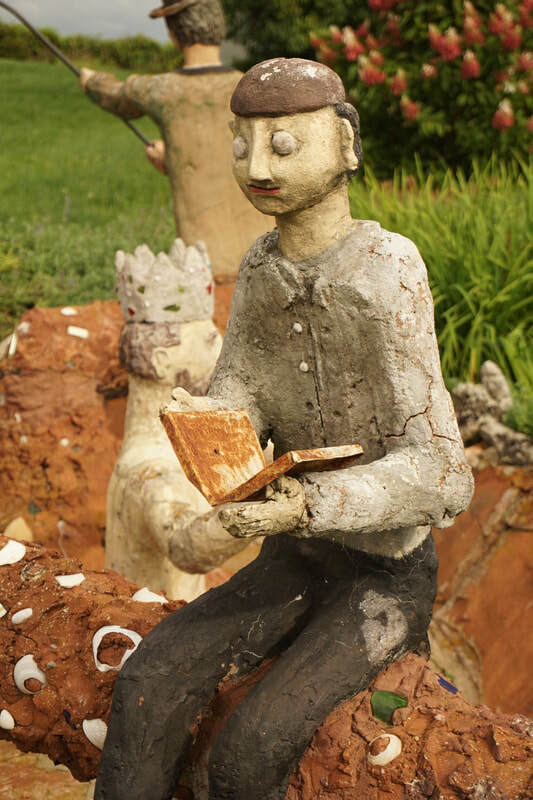 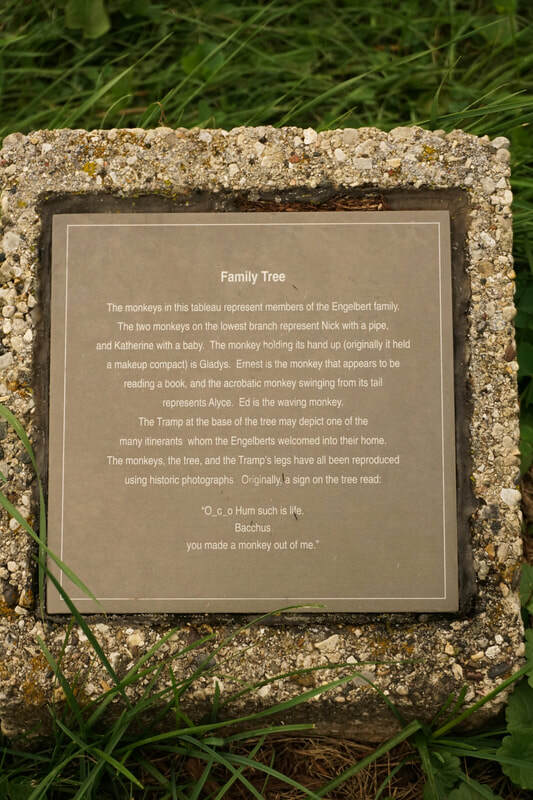 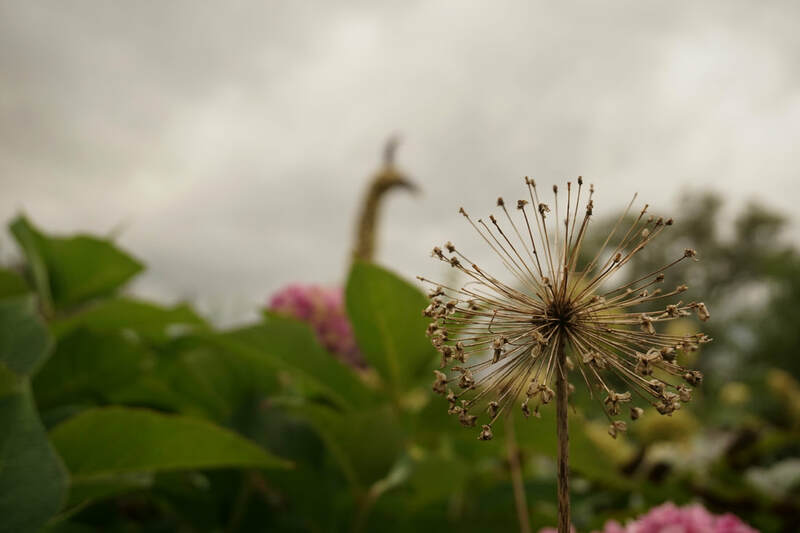 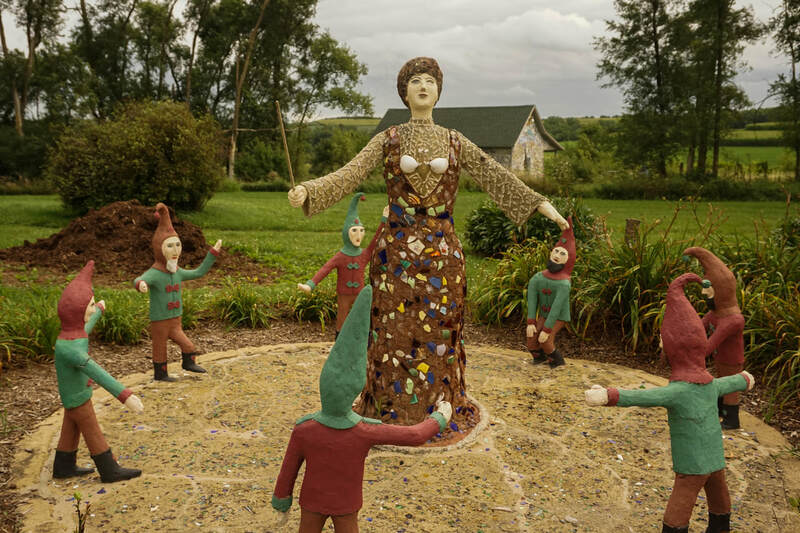 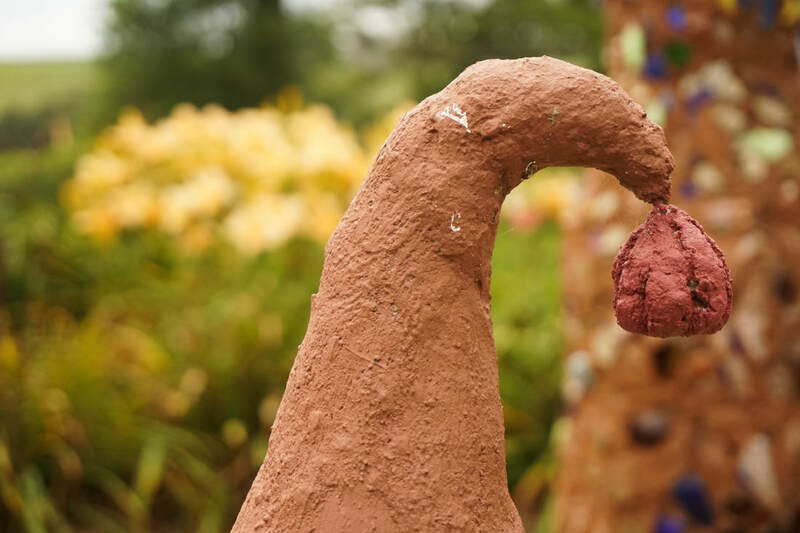 Another unique art garden in Wisconsin! 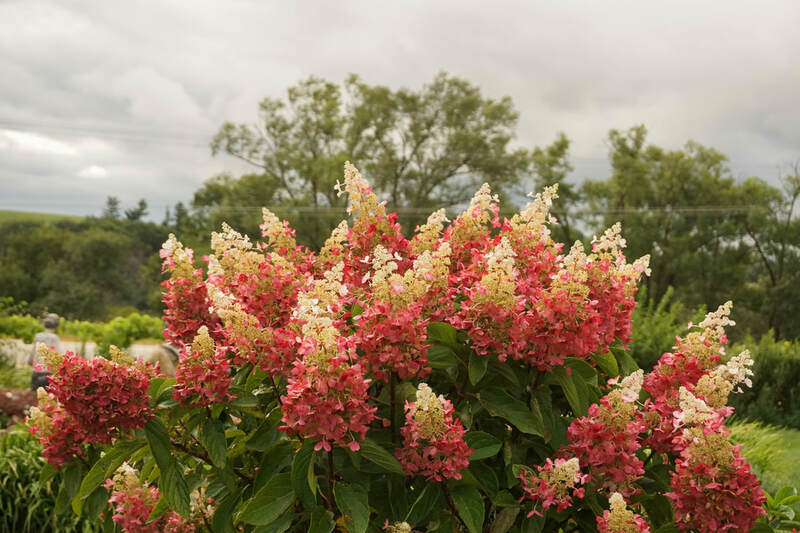 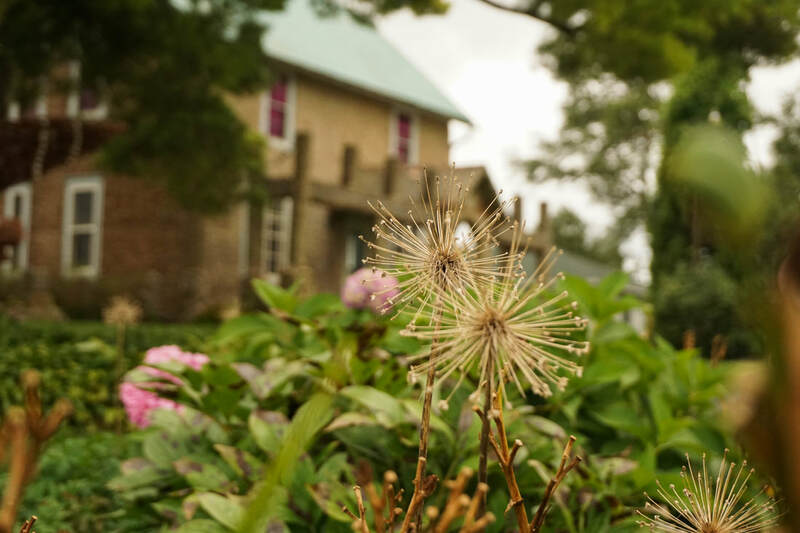 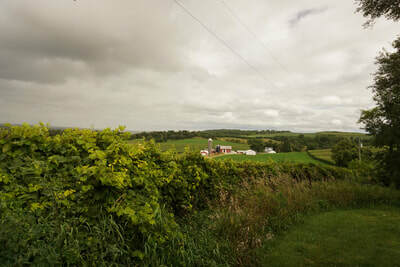 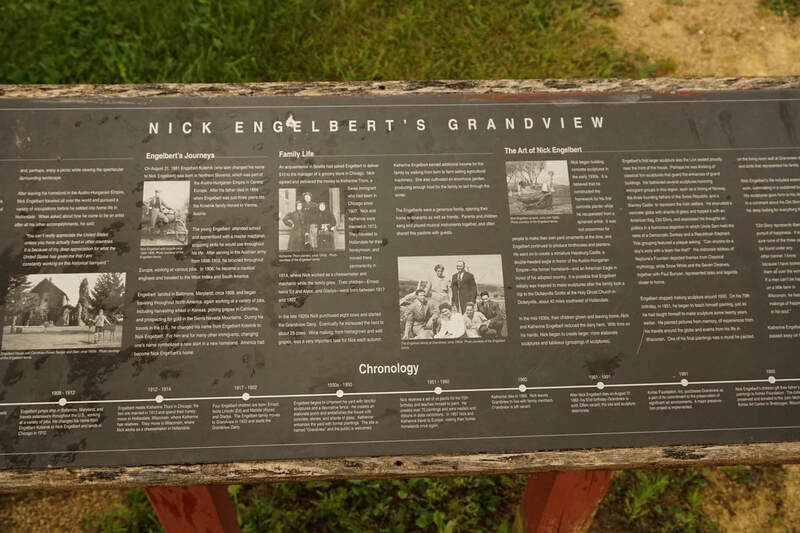 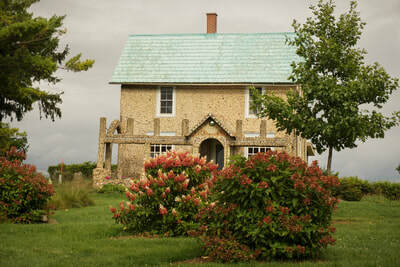 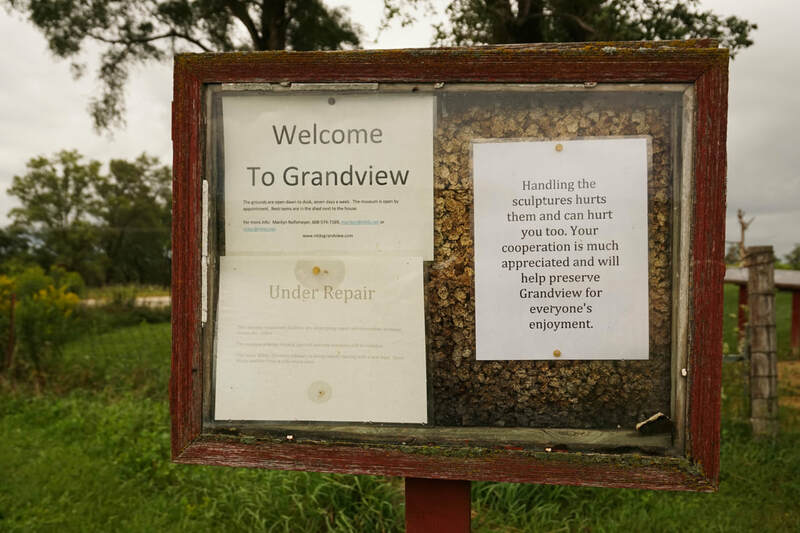 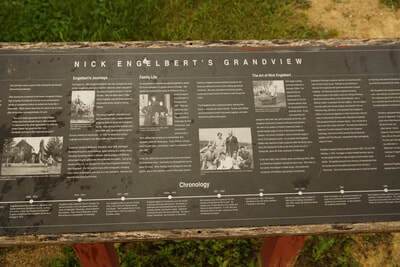 Nick Engelbert's Grandview is located among rolling hills just outside of Hollandale. Nick Engelbert's creative vision began in 1937 when he modified his simple family farmhouse with an elaborate framework around the entry, featuring embellished concrete. 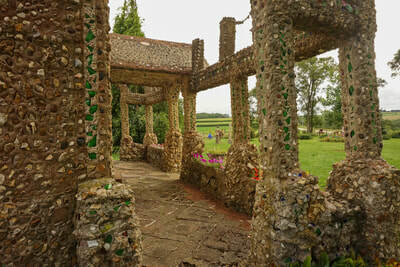 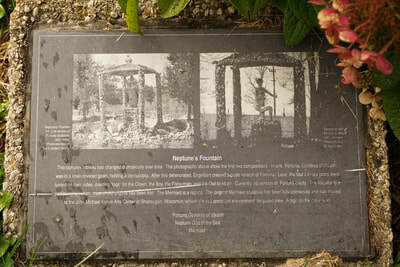 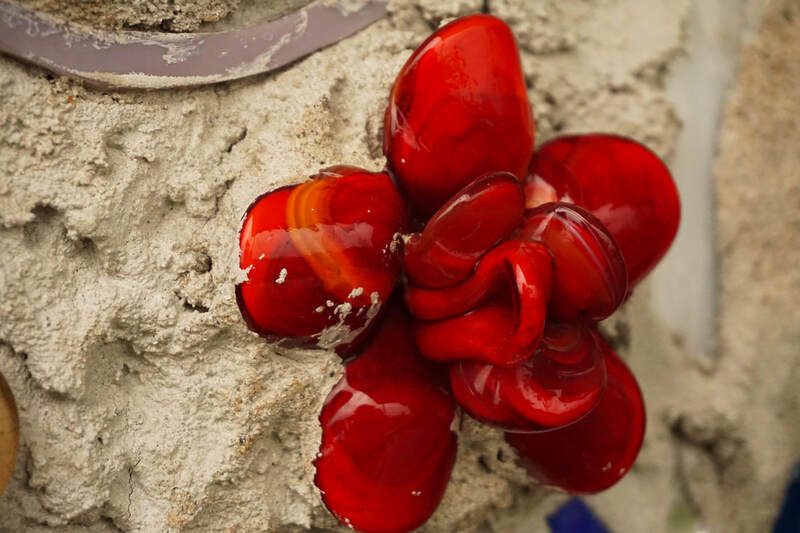 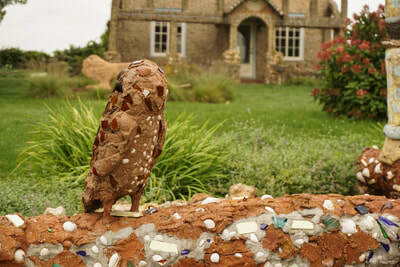 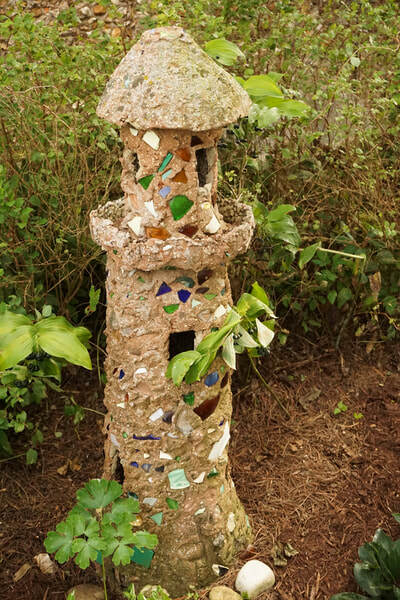 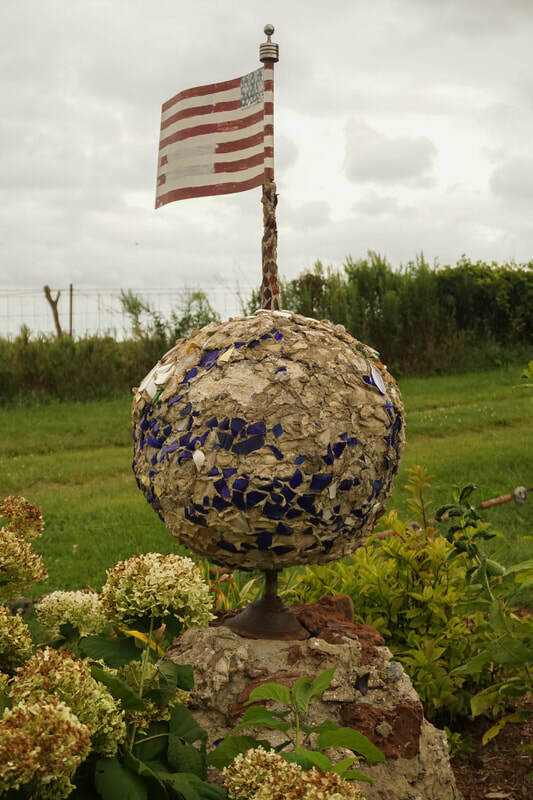 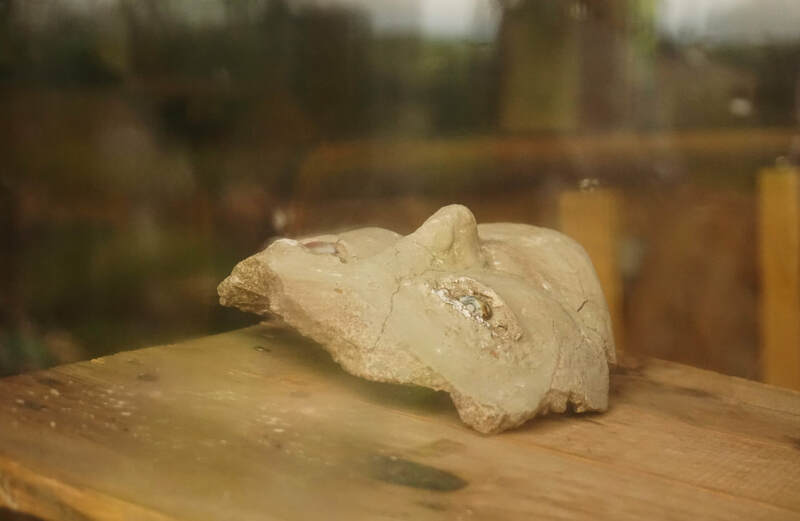 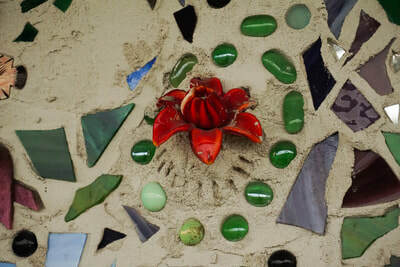 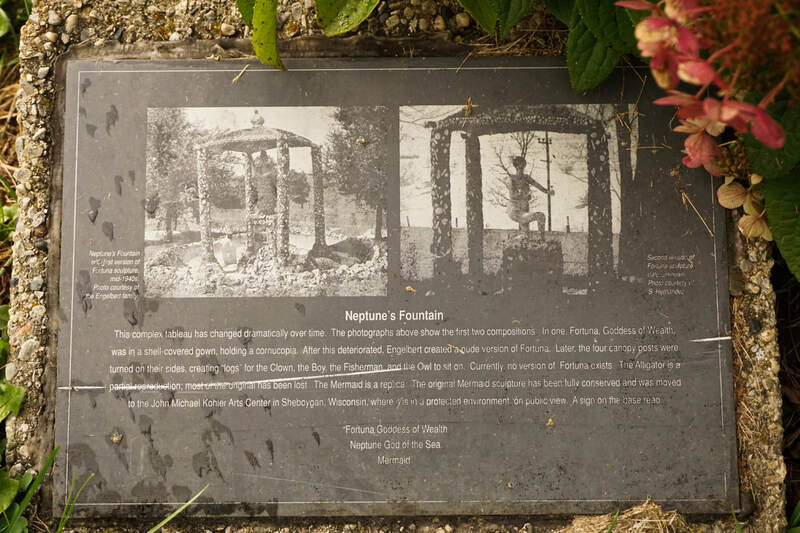 Eventually, he covered every inch of the outside surface of the house with concrete inlaid with shards of china, glass, beads, buttons, and sea shells. 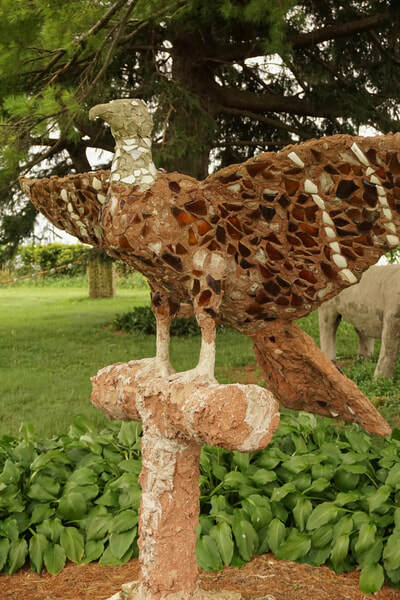 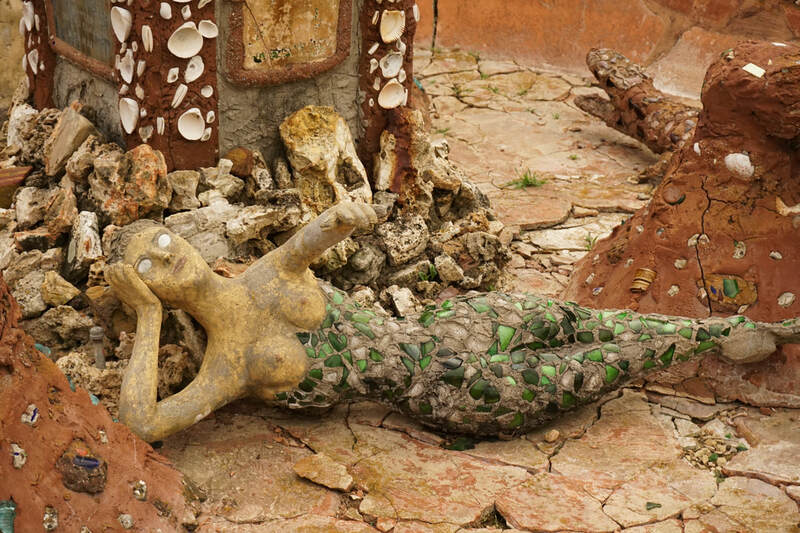 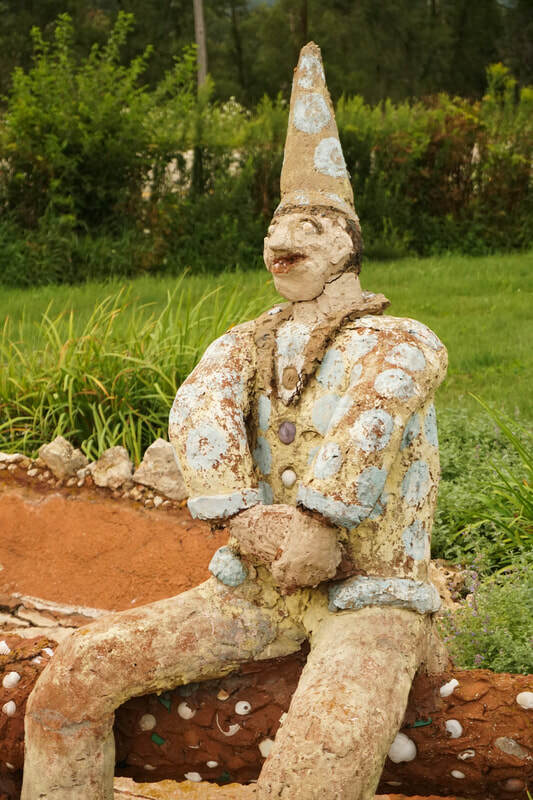 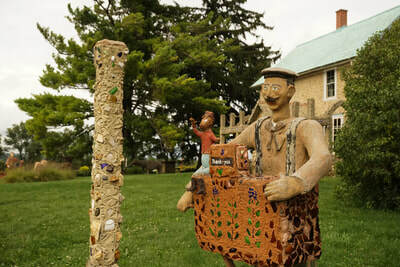 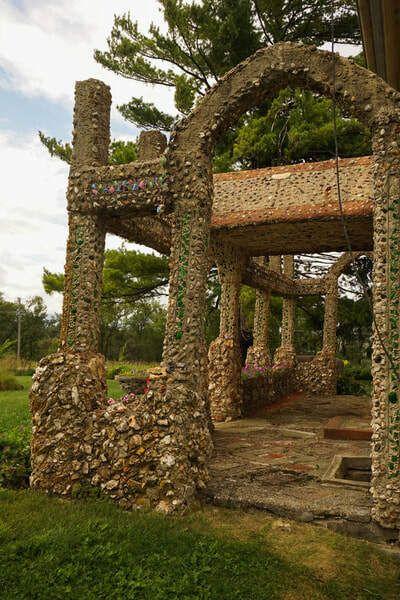 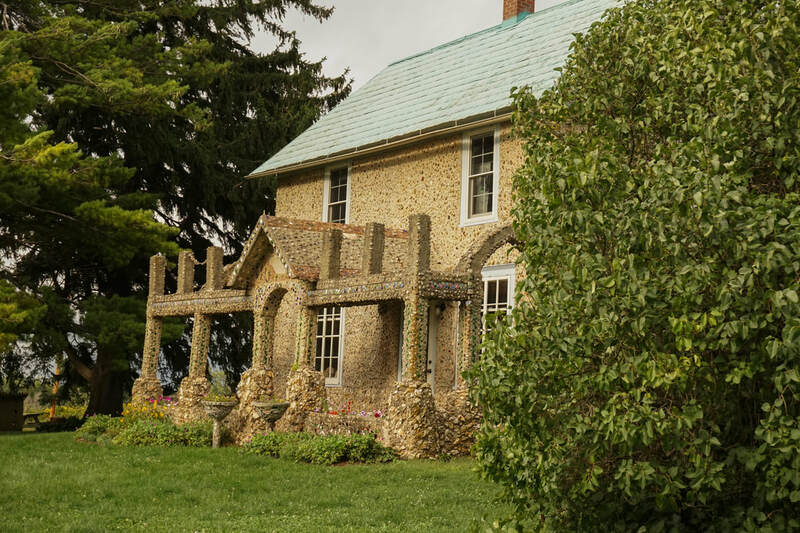 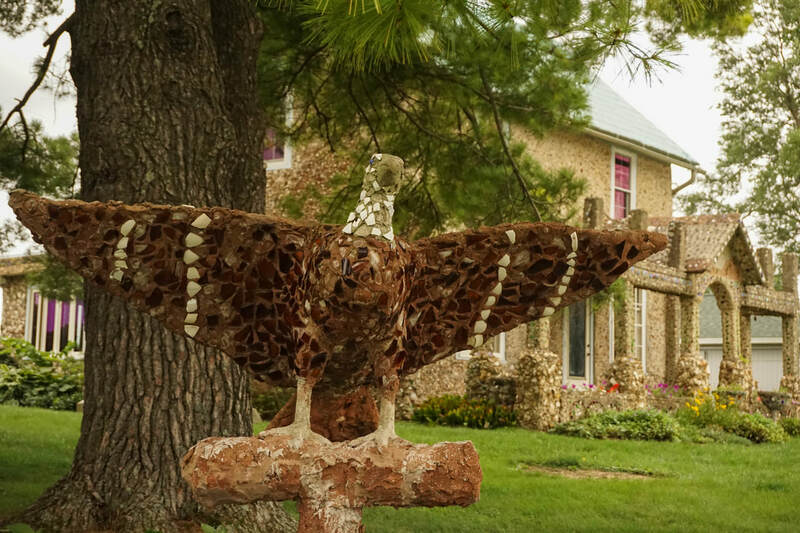 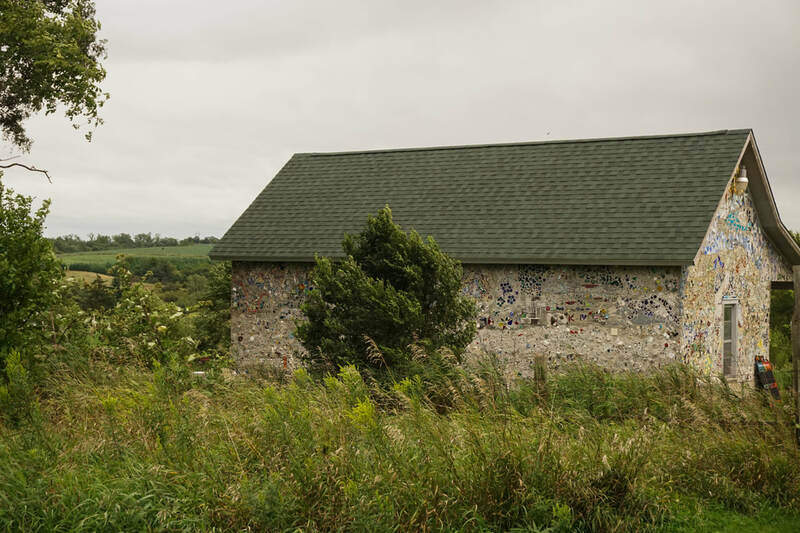 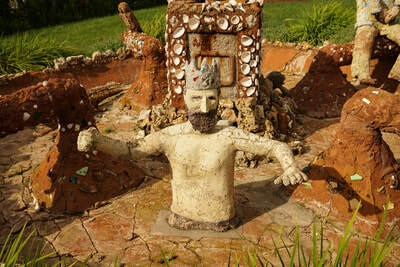 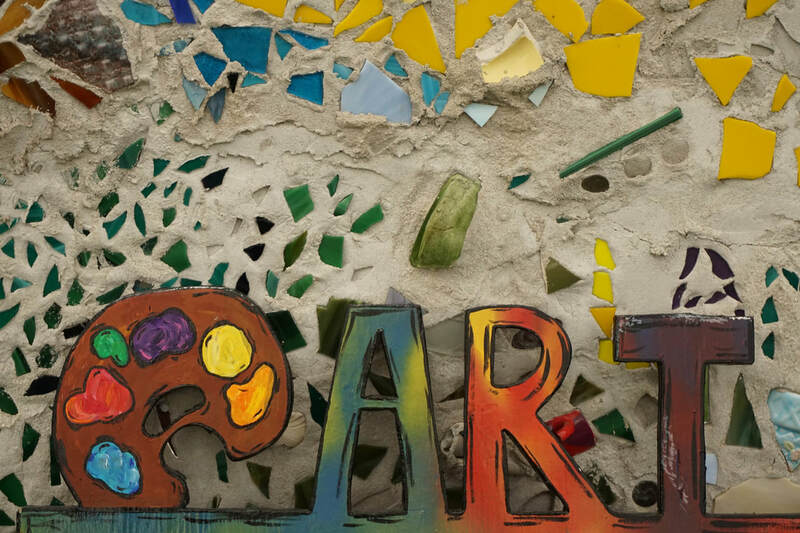 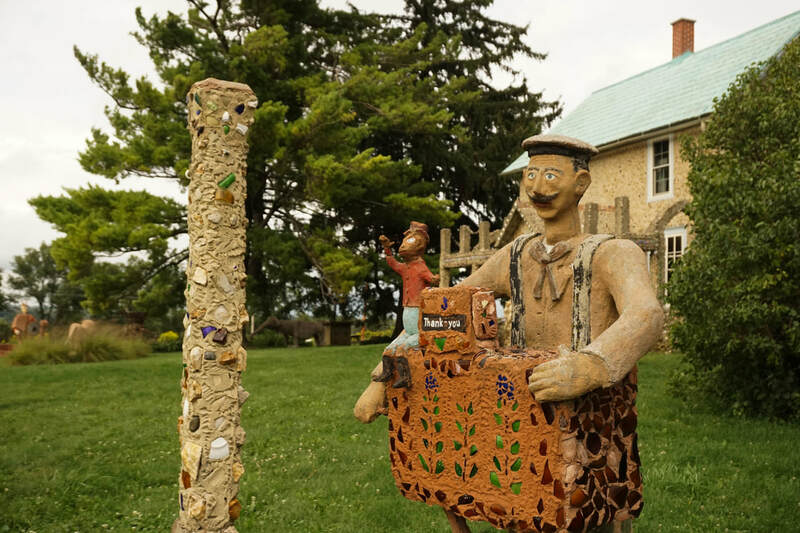 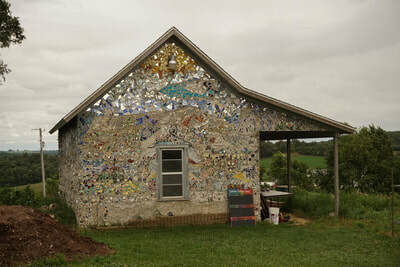 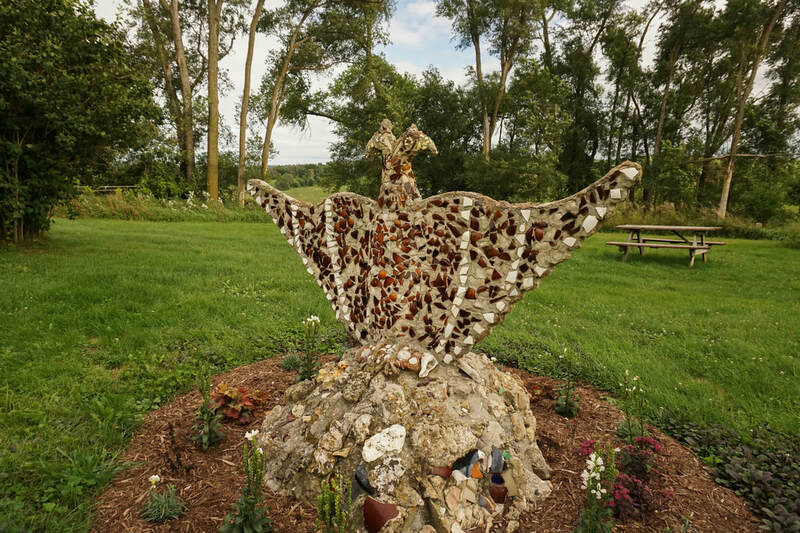 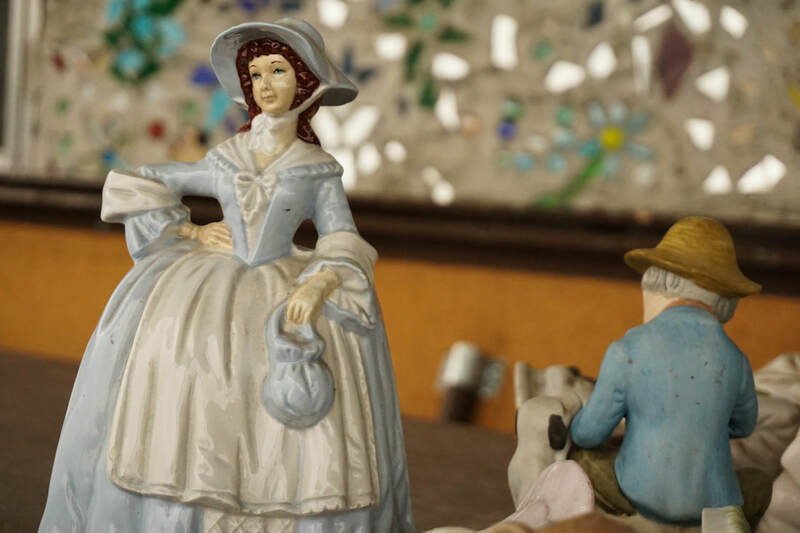 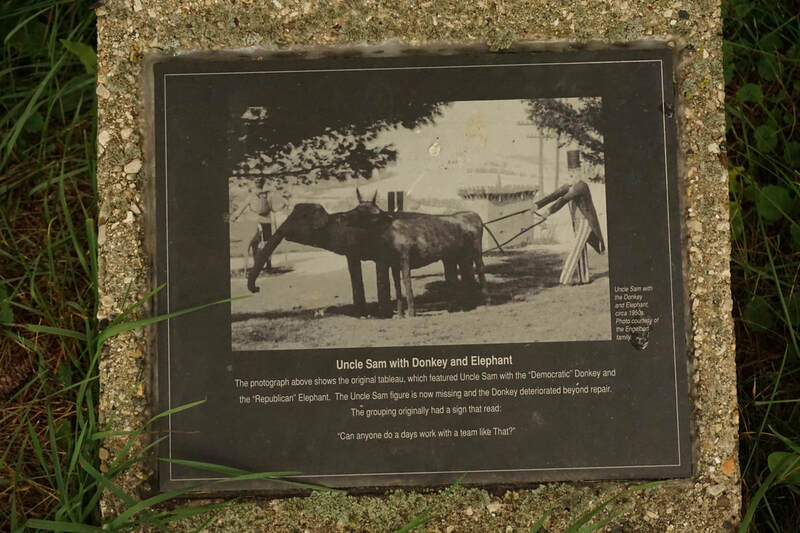 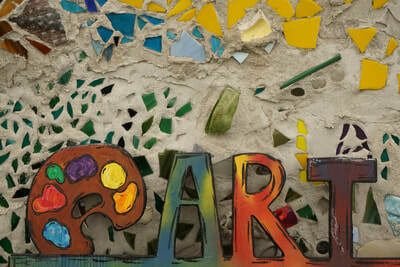 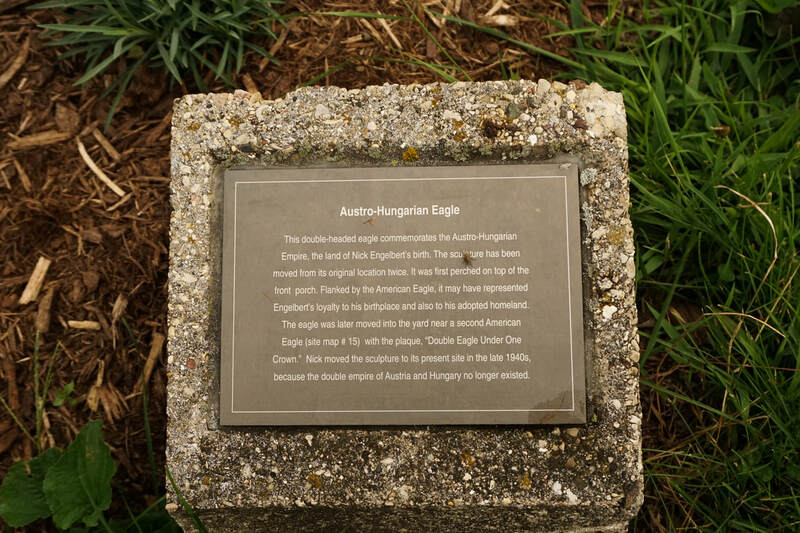 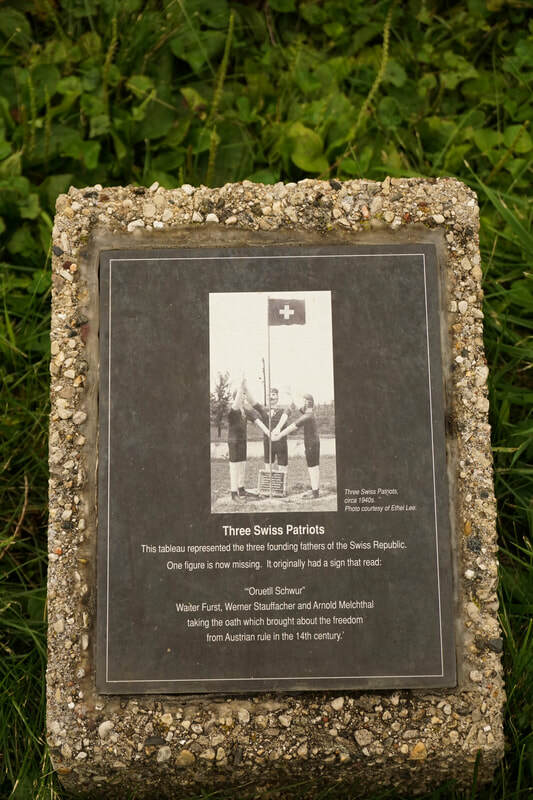 Once the house mosaic was completed, through the next 15 years, Engelbert created over 40 different concrete sculptures, depicting images from fairytales, and pieces in tribute to his family heritage in Hungary, and in tribute to his adopted homeland of America. 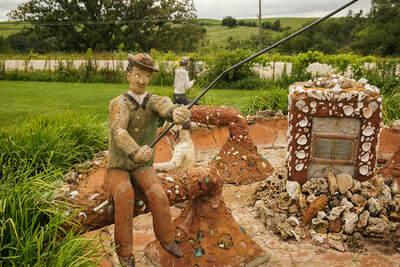 Years later, at the age of 70, he traded his chisel for a paint brush and began creating oil paintings instead. 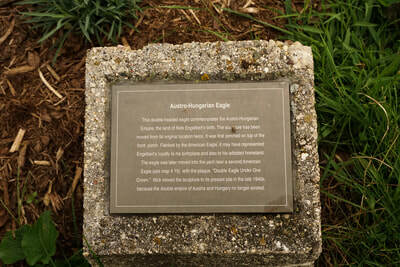 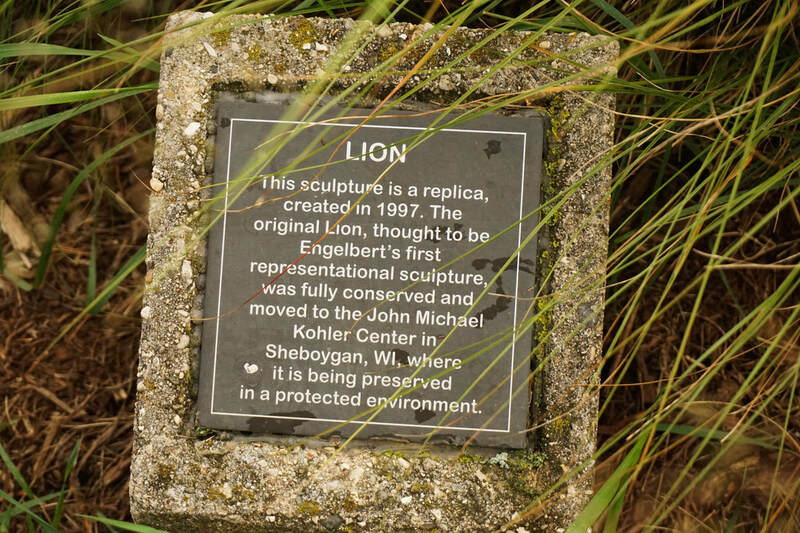 Not all 40 of Engelbert's pieces are still on location. 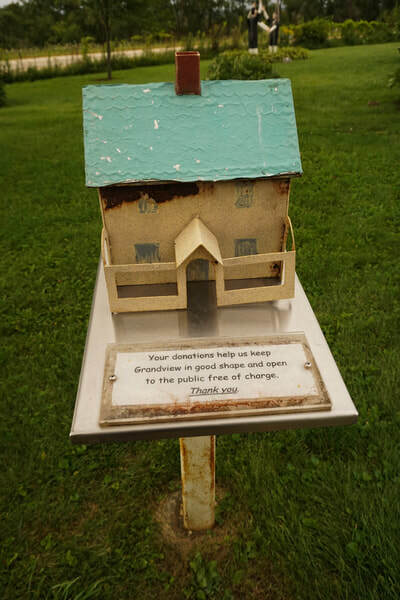 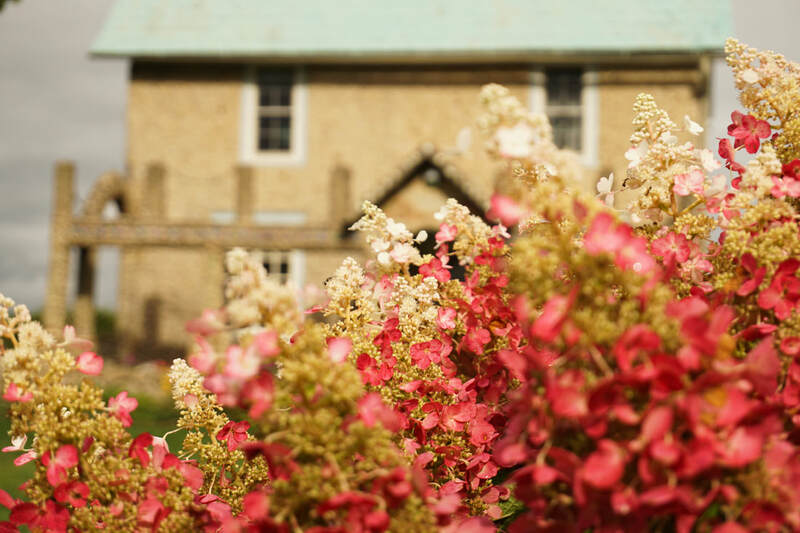 Some have a home and proper preservation at the Kohler Foundation art gallery. Some, in disrepair, have been recreated. Some have fallen away with the passage of time. But there is plenty still to see. 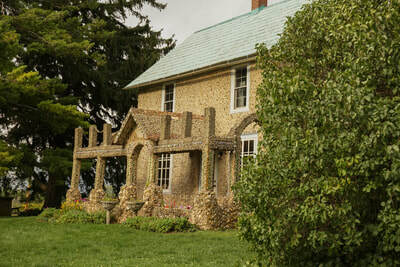 The house itself now operates as a museum. The day we were there it was not open for viewing. 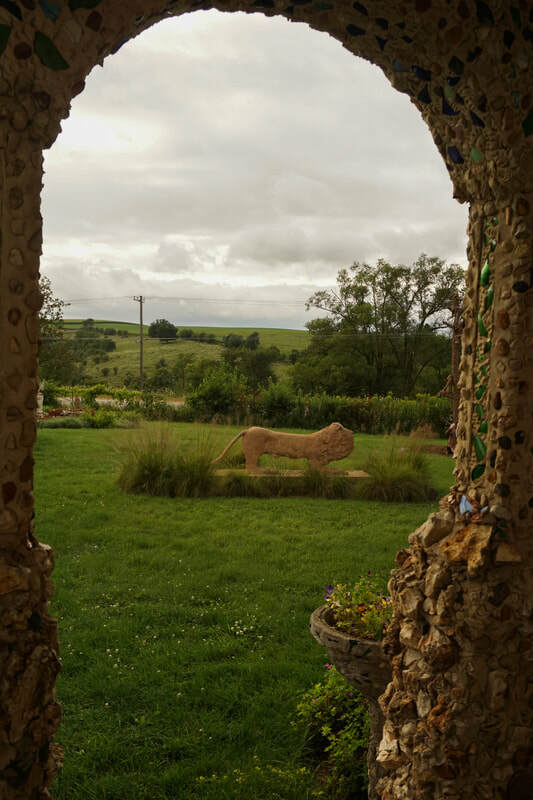 Though we peered in the windows a bit. I would recommend checking first if you plan to tour inside the house/museum. 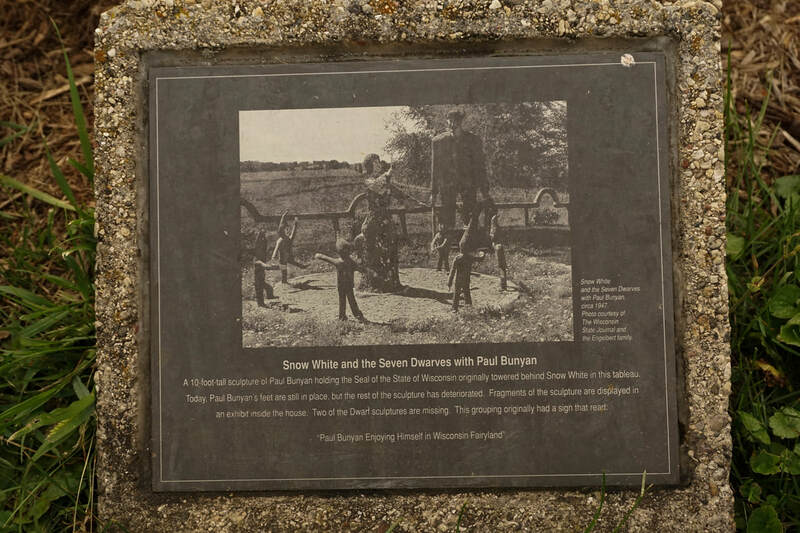 The grounds, however, are open daily until dark.